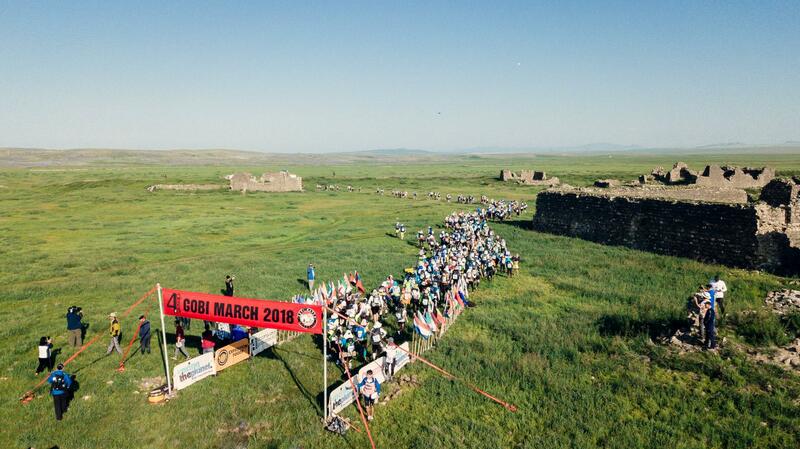 The first Breaking News for the Gobi March 2019 will be posted in July 2019. 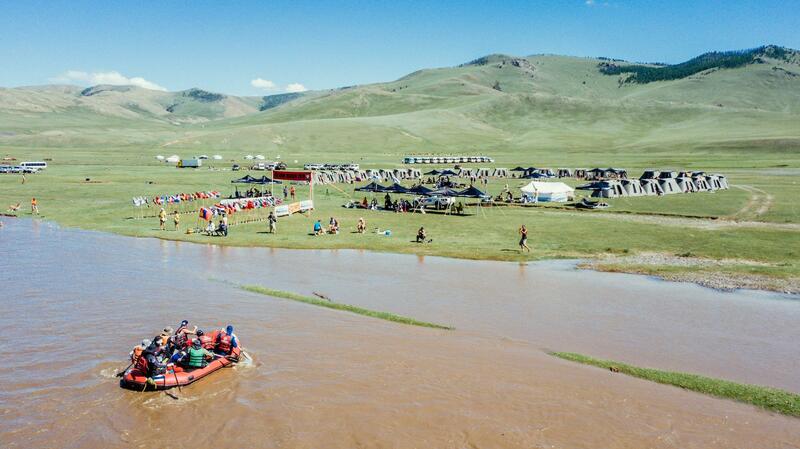 After a long journey from Ulaanbaatar on a bumpy road, 232 competitors and the all staff arrived at Camp 1 in the Ruins of Khar Bukhin Balgas Palace. The sun came out and Mongolia showed off it's beauty and wildness. After a welcome from some local musicians and performers competitors settled in to their new surroundings and meeting their tent mates for the week. 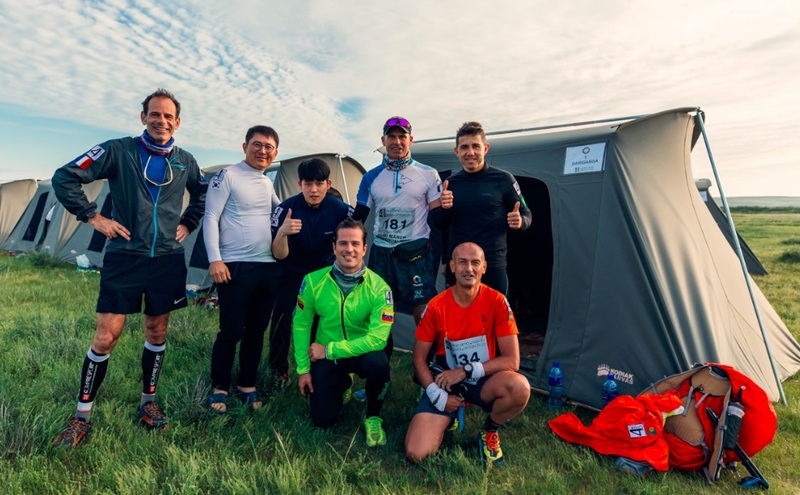 Tentmates from Tent 1 - Genghis Khan: Stephane Boss from France / Canada, Kim Hongseog and Kim Seungwoo from Korea, Dario Mariani Sung from Venezuela / United States, Christophe Santini from France, Nuno Martins from Portugal and Bruno Ribeiro from Brazil. Today comeptitors for the Gobi March (Mongolia) 2018 will head to Camp 1 which is in the ruins of of an ancient Palace of the Kitan people about 3 hours drive from Ulaanbaatar. They have had their last sleep in a comfortable, last shower and are making the most of the available food and internet connection. The pre-race Briefing took place this morning welcoming all participants to the race and providing reminders on rules, safety and information about the course and expected weather. 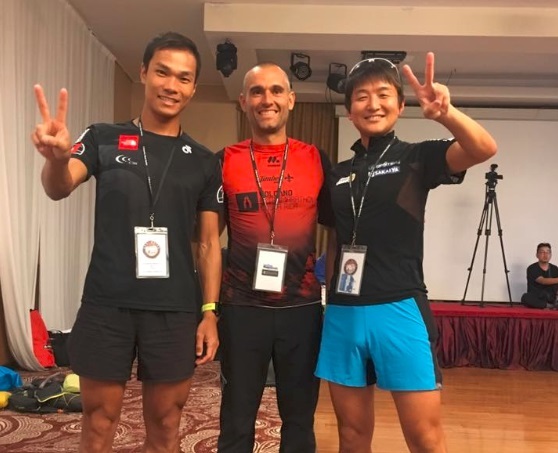 A special congratulations went to Wong Ho Chung, Alice Lee and Celvin Tseng from Hong Kong who won awards at the annual Hong Kong Trail Running presentation last night (but could not attend being in Mongolia). Gunnar Nielsen from Norway was also given a special mention as he was at the very original Gobi March in 2003. Race Check-In is going on now - more than half of the competitors have already been through. All equipment is checked, forms are signed, medical doctors are met, bags are weighed and their race bib and timing chip is picked up. Stephen Wise: "This is really different from last year in Namibia. Then, it was all new. First desert. First multi stage race. A journey into the unknown. This time, I'm supposed to know what I'm doing - even if I don't :-)"
Megan Lay from "Last night in fresh crisp sheets before a week sharing noises and smells and thoughts with now tent stangers but soon to be tent buddies. Nervous but still excited - just want to get started now. I've seen to many organic fit looking people - I need to see the whole group to find "my people"
Miguel Sagastume from Guatemala " Here in Ulaanbaatar, getting all my energy ready to go. Soon it is going to start! 250km of an epic journey." Vicky Huffey "I’m writing this from the comfort of my hotel room, before we make the final checks and move out into the desert. I savoured clean sheets and a comfy bed last night, knowing that in the next week i’ll be sharing a tent and the noise that 8 tired racers will make, and sleeping on a thin mat on the floor. I love hearing others people’s experiences and know that i’ll Be adding my own to this. There’s a few clouds and a beautiful sunrise this morning and the weather is surprisingly cool. Can’t wait to get up into the hills and experience the wilderness that I saw from the plane. But first, time to eat my body weight in breakfast!" Less than Two days to go until the Gobi March 2018 starts! It will take place in Mongolia for the first time since the annual 250km / 155 mile, seven day ultramarathon started 15 years ago. Be sure to follow the race with photos, videos, results, blogs, stage updates and features. Left to right: Wong Ho Chung from Hong Kong, Vicente Garcia Beneito from Spain and Wataru Iino from Japan - the three favourites to win the race. 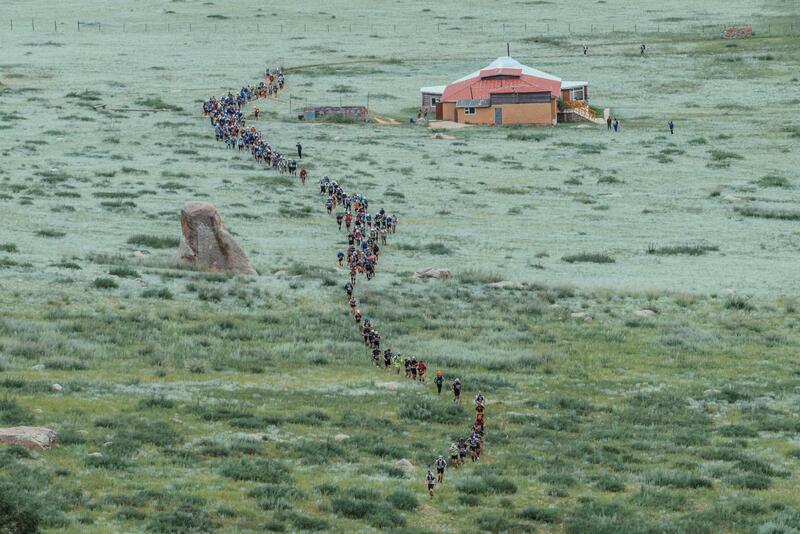 The Gobi March (Mongolia) 2018 will start on Sunday, 29 July. Breaking News will be posted four or five times during each stage to update you on the progress of the race including the leaders, the middle of the pack, the back of the pack, competitor comments, as people pass through checkpoints, the weather any other relevant information. Subscribe to receive breaking news to your email or look here for updates as they are posted. This is the first Breaking News for the Gobi March (Mongolia) 2018! 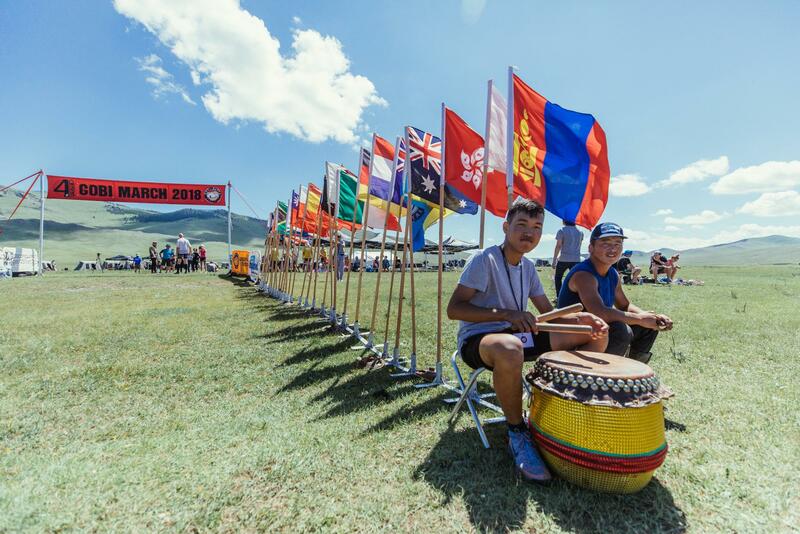 In 3 days time more than 200 competitors representing 50 countries from around the world will line up to follow the footsteps of Genghis Khan racing 250 km / 155 miles across the Mongolian wilderness. Ulaanbaatar, the capital of Mongolia, and host town for the Gobi March, is already alive with excited racers. Jacqui Bell from Australia has been there for nearly a week already acclimistising and exploring - she is aiming to be the youngest female to complete the 4 Deserts Grand Slam. Uncle and niece, Rene De Klein and Karin Teuben from Holland arrived today with some other competitors through Moscow but without their luggage. 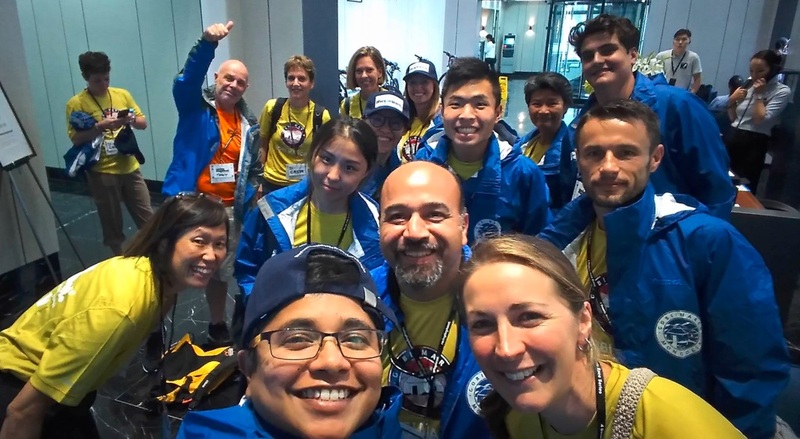 Most of the Little Desert Runners from Germany, Austria, Swtizerland and one Polish person have also arrived - Rafael Fuchsgruber and Tanja Schoenenborn have been exploring the town. Team Free to Run from Afghanistan start their journey today - for the two Afghan girls this is the first time they have left their country! We recommend reading the BLOGS that are being posted as competitors arrive in Mongolia, make their final preparations for the race and explain "why" they chose to run 250km / 155 miles across the Mongolian wilderness.